Buttle Church (Swedish: Buttle kyrka) is a medieval Lutheran church in Buttle on the Swedish island of Gotland. 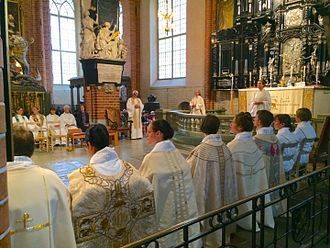 The church is in the Diocese of Visby of the Church of Sweden. It is one of the more well-preserved Romanesque churches on Gotland. Buttle Church is one of the more well-preserved Romanesque churches on Gotland. 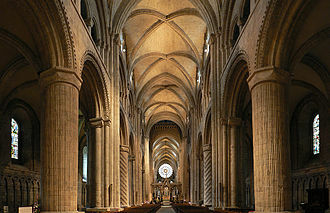 The oldest parts are the western part of the choir and the nave, dating from the second half of the 12th century. The tower was added circa 1220. An original apse was pulled down during the middle of the 14th century and replaced by the present structure with a straight east end, in Gothic style. The only later additions are the windows of the nave, which were made in 1882-83. Internally, the church is decorated with frescos. In the nave, a damaged frieze displaying the Passion of Christ can be seen, while in the tower base there are a set of frescos depicting Saint George and the Dragon, Saint Martin of Tours and a scene in which souls are being weighed. 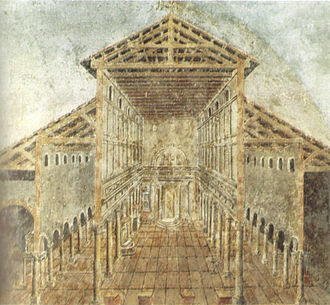 All the frescos in the church have been attributed to the Master of the Passion of Christ (Passionsmästaren) or his workshop. The church retains several medieval furnishings. The triumphal cross is one of the earliest of its kind on Gotland, dating from the end of the 12th century. It was probably made by a local artist but shows influences from German art from the period. 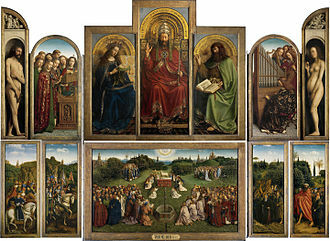 The altarpiece is also medieval, from the 15th century, and still in its original place. The altarpiece displays carved wooden figures depicting the crucifixion and a number of saints. It was renovated in 1956-57. The baptismal font is also noteworthy, from the middle of the 13th century. Its base is decorated with sculpted heads of humans and beasts. The pews are in a vernacular Baroque style. In the 1950s they were restored to their original colour scheme. 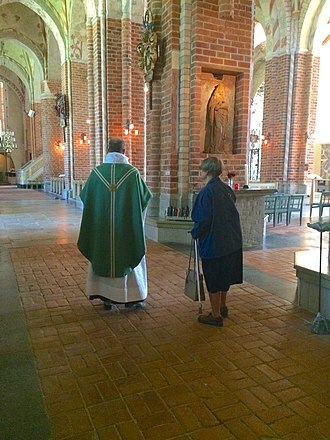 They were probably decorated by the same artist who worked in Vänge Church. ^ a b c Lagerlöf, Erland, ed. (1973). Gotlands kyrkor (in Swedish). Uddevalla: Rabén & Sjögren. pp. 113–115. ISBN 9129410355. ^ a b c "Buttle kyrka". 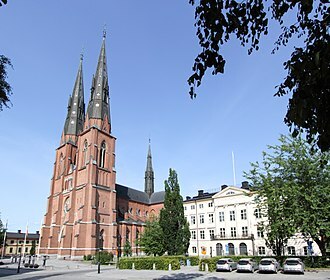 Church of Sweden. Retrieved 18 June 2014. 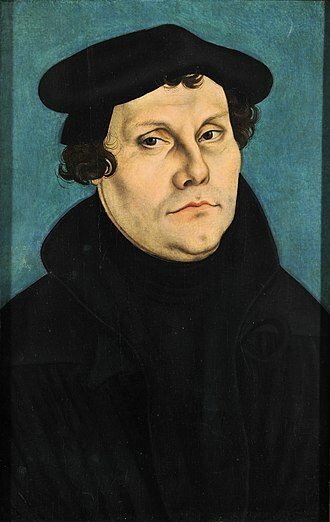 ^ Renovatio Mundi (11 July 2018). "Passionsmästaren". 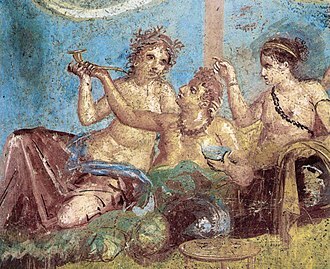 renovatiomundi.blogspot.com. Retrieved January 1, 2019. Curman, Sigurd; Tuulse, Armin (1952). Buttle kyrka (PDF). Sveriges kyrkor, konsthistoriskt inventarium (in Swedish and English). 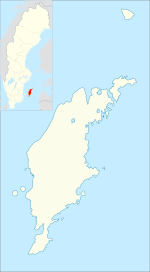 Gotland. Band IV, halvband 1. pp. 380–409. Retrieved 21 October 2014. Endre Church is a medieval Lutheran church in Endre on the Swedish island of Gotland, in the Diocese of Visby. The presently visible church was preceded by an older, Romanesque church, of this church, only the tower, built in the 12th century and heightened in the 14th, remains. A few stone sculptures have been re-used in the church, e. g. one sculpture depicting a dragon. These are now immured in the southern façade of the church, the rest of the church dates from the 13th century and the early 14th. The building material of the church is limestone, apart from the aforementioned Romanesque sculptures, the exterior of the church is adorned with sculpted portals, both Romanesque and Gothic in style. Internally, the church is decorated with frescos made by the artist known as the Master of the Passion of Christ in the middle of the 15th century, the frescos were uncovered during a renovation in 1915. The church have several preserved stained glass panes from the Middle Ages. The altarpiece is furthermore medieval, from the late 14th century, the triumphal cross dates from circa 1300, and the baptismal font, possibly made by the artist Hegvald, is a Romanesque piece from the 12th century, richly decorated. Barlingbo Church is a medieval Lutheran church in Barlingbo on the Swedish island of Gotland, in the Diocese of Visby. 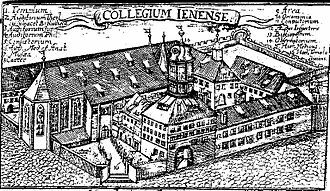 The presently visible church was finished c and it was however preceded by another church, whose foundations have been discovered under the floor of the present one. The oldest parts of Barlingbo Church are the choir and apse and these have been dated to 1225. Following this, the nave was built, and lastly the tower, the church in its entirety dates from the 13th century. 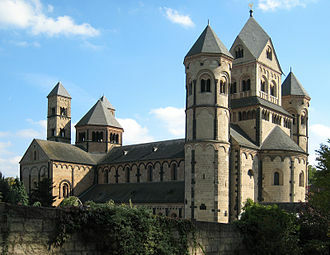 The church has three portals, two of which are in Gothic style and one, the oldest, which is still in the Romanesque tradition, in the western, tower façade there is a rose window. There are Gothic windows with still extant painted glass from c.1280 in the apse, Barlingbo Church is divided by vaults in three sections, length-wise. 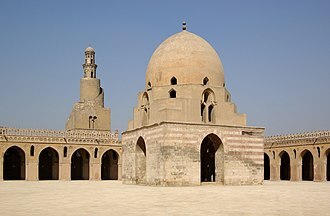 Its consciously conceived plan has been interpreted as being influenced by Cistercian architecture, the walls are decorated by frescos from different times. 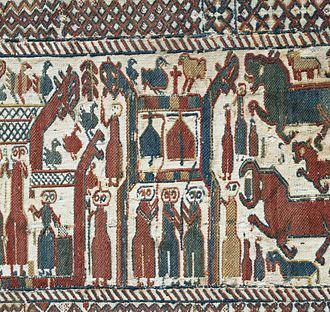 Oldest of these are a number of decorative, grey triangles and crosses. A set of more monumental but likewise purely decorative frescos in the nave, from the 14th century, are frescos in the apse depicting six apostles, unique in their appearance on Gotland. Among the furnishings, the altar has a Baroque top, dated 1683. The triumphal cross is from c, perhaps the most unusual item in the church is the baptismal font, dating from the second part of the 12th century and richly decorated with carved figures. 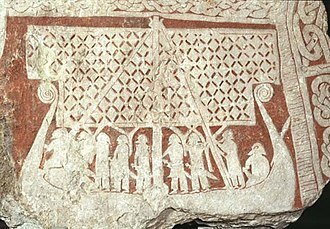 It displays figures from the Bible and the symbols of the evangelists, some of the figures are marked with runes. The unusual font, carved from a block of limestone, is not comparable to any other baptismal font on Gotland. 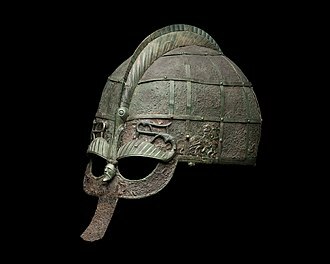 Art historian Johnny Roosval considered it to be one of the finest pieces of art from medieval Sweden, influences from English art from the time have been traced in the font. In the choir, some tombstones from the 13th and 14th centuries are visible, the pews and the organ cover are from the 19th century. One of the bells is from c.1440 and carries inscriptions evoking Christ and Saint Dionysius. Fresco depicting Saint George and the Dragon.